BEIJING: A moderate earthquake rocked southwest China Thursday evening, killing one person, injuring at least 325 and collapsing more than 18,000 homes, state media said. The magnitude-6.0 temblor, centered in Yunnan province's Yao'an county, damaged another 30,000 homes, the Xinhua News Agency said. Thirty people suffered severe injuries, while the other 305 were slightly injured, Xinhua said. The quake was followed by eight aftershocks and the provincial civil affairs department was sending 4,500 tents, 3,000 quilts and other relief materials to Yao'an, Xinhua said. More than 300 soldiers and hundreds of police were dispatched to the disaster zone, according to the CCTV news and Xinhua. 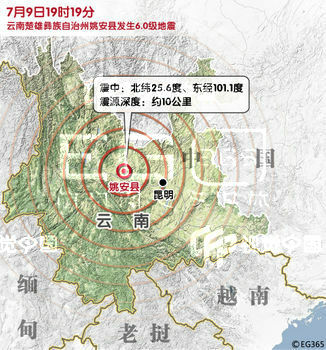 Yunnan is a quake-prone, mountainous region that lies on China's southern border with Thailand and Myanmar. It also borders Sichuan province, where a magnitude-7.9 quake last year left almost 90,000 people dead or missing. In 1988, a 7.1-magnitude quake in Yunnan near Myanmar killed more than 722 people.